Virginia@: [Peninsula-Patriots] FW: -- SPAM --Re: Join Us! Road to Repeal Rally! [Peninsula-Patriots] FW: -- SPAM --Re: Join Us! Road to Repeal Rally! Anyone driving to DC tomorrow for this? Subject: -- SPAM --Re: Join Us! Road to Repeal Rally! Had to change my plans- I will be in DC - so will try to meet up with you all at the rally! Subject: Join Us! Road to Repeal Rally! It is imperative that Americans support the March 24th "Road to REPEAL" Rally THIS SATURDAY at Noon, Upper Senate Park to demonstrate our resolve to end ObamaCare. Sign YOUR petition and we will send it to the Supreme Court AND Congress! THEN JOIN US IN WASHINGTON THIS WEEKEND! Nearly two years ago Obama signed into law a massive overhaul of our healthcare system. At the time the legislation was touted as vitally important to bringing down the costs of healthcare while at the same time providing care to millions of Americans. Now that ObamaCare is law we are learning, as Nancy Pelosi so infamously told us, just exactly what is in the bill – and that Americans are just as opposed to it now as they were then. WE NEED MORE PETITION SIGNERS TO TELL THE SENATE: – REPEAL IT NOW! "CAN YOU HEAR US NOW"? ObamaCare –The Patient Protection and Affordable Care Act – is an unprecedented expansion of federal power that redefines the Constitution and distorts the intentions of our nation's Founding Fathers. We all know that ObamaCare is unAmerican, unjust, and unaffordable! It already is wreaking loss of care, loss of coverage, loss of doctors, crushing debt, rising taxes, joblessness, intrusive growth of government, skyrocketing health insurance costs and devastating federal deficits upon our nation. ObamaCare is now expected by the Congressional Budget Office to cost the nation over TWO TRILLION DOLLARS! Neither the U.S. Constitution's Commerce Clause nor its Necessary and Proper Clause (now embraced by the Congress as the "elastic clause'' of unbridled government overreach and intrusion) grants Congress the power to coerce purchases of goods or services upon free Americans. The Congress cannot lawfully impose a direct individual mandate to purchase healthcare insurance. Congress has never before attempted to use the Commerce Clause to justify imposing a mandate on economic inactivity should a citizen refuse to purchase said good; interstate commerce would not be affected. Many Americans are now convinced that ObamaCare is the linchpin legislation of a broader attempt by a hard-left Congress and Executive Branch to fundamentally and unconstitutionally alter our founding institutions and system of government. America has not seen such an assault on and blatant disregard for our Constitution since our Founding. Now, as the Supreme Court prepares to hear arguments on the constitutionality of ObamaCare, it is IMPERATIVE that this unlawful legislation's abuse of federal powers become better known and understood by the America people. YOUR INFORMED VOICE MUST BE HEARD! Whether the Supreme Court strikes down the individual mandate, throws ObamaCare out in its entirety, or we are left finally with the only option of REPEAL in the Congress – ObamaCare must not stand! Especially if you cannot attend, SEND YOUR BLAST FAX! Government-run healthcare is the best example of everything wrong with the federal government. It is bloated, inefficient, coercive and intrusive! It is financially reckless. No one knows what it will ultimately cost – or how in the world America will pay for it. Worse, ObamaCare invades the federal government into every aspect of our lives. It empowers and grows government into a massive bloated bureaucracy making healthcare decisions that directly affect you and your loved ones. In fact, just in tax enforcement, the federal government must hire more than 17,000 new IRS agents for this monstrosity. We need your help to stop government-run healthcare! 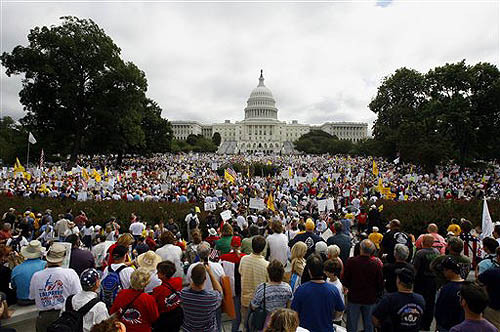 Join thousands of fellow Americans who oppose ObamaCare. Come to Washington, DC and be a part of the Road to Repeal Rally on March 24. ObamaCare is set to be heard by the Supreme Court of the United States the following week and we need your help to send a strong, clear message to the Supreme Court and big government Washington that we want REPEAL, not trampling of our personal choice and freedom. Join us on Saturday, March 24, 2012 for the Road to Repeal Rally. This email was sent to dakotasky109@aol.com by patriot@ravfoundationnews.org. To ensure delivery of emails to your inbox, please add patriot@ravfoundationnews.org to your address book or safe sender list. Learn more. If you are having trouble viewing this email, click here. to Unsubscribe to future emails. To Report Abuse click here.